"This really pushes back against the idea you need an Earth clone—that is, a planet with some land and a shallow ocean," said Edwin Kite, assistant professor of geophysical sciences at UChicago and lead author of the study. As telescopes get better, scientists are finding more and more planets orbiting stars in other solar systems. Such discoveries are resulting in new research into how life could potentially survive on other planets, some of which are very different from Earth—some may be covered entirely in water hundreds of miles deep. The simulations assumed stars that are like our own, but the results are optimistic for red dwarf stars, too, Kite said. 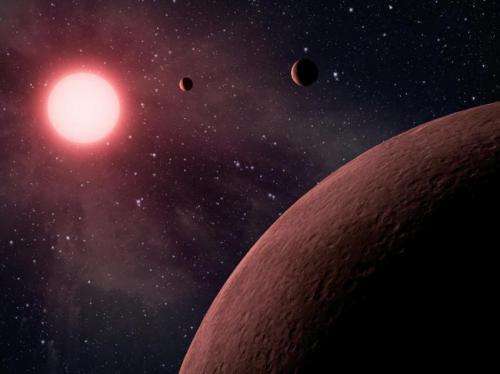 Planets in red dwarf systems are thought to be promising candidates for fostering life because these stars get brighter much more slowly than our sun—giving life a much longer time period to get started. The same conditions modeled in this paper could be applied to planets around red dwarfs, they said: Theoretically, all you would need is the steady light of a star. They never said much in physics class about; a thrown stone that hits the water, falls at constant velocity losing it's acceleration after being submerged. So would life be weightless on jupiter if it did have a water/liquid surface? I was not aware that there was a big push to believe that life required an earth clone. On the contrary. The general consensus based on my reading is that life is expected on many different types of planets and other bodies. with the wallet out of your purse. A number of the combicbook fantasists will gullibulllee accept this simulation as definitive proof of their fairytale dreams. After strident denunciations of many other simulations and the speculative conclusions drawn! Notice the line in this article "Our best guess is that it's on the order of 10 percent of them." Which if correct? Has reduced the probability of "Lining Worlds" by another nine-tenths. Still flogging the red dwarfs for possible LWs? Anyone yet find a red dwarf that isn't spitting out violent outbursts of x-rays on a regular basis? The high-order probability is, any rocky planet in a stable sweet spot orbit will be a dried-up, airless skull rolling about it's primary. I don't doubt that life, of some sort, could thrive on some of these 'ocean planets' (planets completely covered in oceans). But, somehow, I don't think it would be likely to be as interesting as life that evolved on land. I am fairly certain that if we are interested in intelligent life with technology in particular, because life on an ocean planet is very unlikely to evolve to such intelligent life with technology due to a lack of solid materials available for basic tool-making (I assume there cannot be a "stone-age" as a precursor to it), ocean planets may be of little interest to those of us searching for life because of this. But I guess it just depends on what interests you and what you are looking for. humy: advanced life could evolve in oceans, an opposable thumb is key. It would also be very useful to have a good pair of gills to breathe underwater. If humans ever arrive at such a water world, a surgical procedure may be necessary; or a way to grow gills found, in order to provide a human foetus with natural gills. On the sides of the neck, not far from the windpipe. IIRC the human embryo, after its cells have grown sufficiently to have a heart in its chest, is endowed with gills - somewhat similar to fish gills. I have always been curious about that phase in human development. One of the problems of course with red dwarfs is the extreme flaring and explosive solar activity we see around them, especially in their earlier years. This leads to the conclusion that the average time between sterilization events in a earth-like clone is around a few million years for most systems. Water is one of the best radiation shields there is however, and a few hundred meters of water should prevent global sterilization from occurring, especially if the surface is ice covered like Europa is today. Then we only need some way to provide energy, and it shouldn't really matter what the actual surface temp is, as long as significant amounts are liquid, i.e. energy input. What would the opposable thumb evolve to do in the ocean where there isn't much solid material to make into tools? What would the first tools be made of? Even before our opposable thumb, grasping hands evolved in tree climbing species, never in the ocean. It's hard to see how a hand similar to ours could evolve on a water world, it would have to be something that does not swim for a living leaving some hands free, like an octopus. Even presuming an intelligent octopus, it would be very hard to develop almost any technology without fire. It would be presumptuous to claim that any planet could be exclusively a water planet with no land whatsoever. It just is not possible, unless the water has no wave activity and there are no winds to drive possible currents. On Earth there are very high mountains under the surface of the oceans, as well as underwater volcanic activities that are island builders. And, depending on the type of material at the ocean bottom, water is often found seeping down into the upper mantle where it eventually fills cavernous places. SEU this article is about water worlds, not dry planets like the earth. The earth only has 0.05% water/mass, water worlds have much more. Even a small body like Enceladus might have an ocean more than 30km deep and on larger worlds the oceans are speculated to be so deep that even at high temperatures a mantle of ice forms at depth due to the extreme pressure. Jupiter has no land area and is covered in oceans; just not water oceans. And some of the moons in our solar system are covered in water oceans covered in thick layers of ice so it isn't a huge stretch that a water-ocean planet could exist not covered in ice. unless the water has no wave activity and there are no winds to drive possible currents. What has "wave action" or "wind" or "currents" got to do with it? Jupiter has no land area and is covered in oceans and has "wave action" and "wind" and "currents" and it exists just fine. If that can exist (like it does) then why not a water-ocean planet with "wave action" and "wind" and "currents"? humy: there's plenty of solid material in the ocean, plenty of intact rock formations there. I don't see why tentacles, claws, or mandibles or any other manipulatory appendages wouldn't work. You just need to be able to hold something solid while you work on it. I agree. But I still think it unlikely that an ocean life form would become technologically advanced. In an ocean planet, what kind of solid materials suitable to make a tool out of would be in the ocean that an intelligent animal's tentacles/claws could hang on to and form complex useful tools? How would its version of an 'industrial revolution' get started and then result in, say, the building and launch of the first weather satellite etc? I assume there would have to be some mining of the deep ocean floor to get at the necessary raw materials to manufacture it and then it would have to be manufactured without furnaces etc; I would imagine this would be very difficult! I would imagine it would also be hard to do basic science research all underwater esp in physics and chemistry and esp electronics (because electronics and water don't tend to mix well). Perhaps they could first invent some floating platforms and conduct their science experiments on top of them? Glove boxes in fume hoods sealing off water. But geez, chemistry would be tough, yes. We have, one, singular planet known to have intelligent, oceanic lifeforms. The whales, dolphins, porpoise and pennipeds. All mammal, none with opposable thumbs. Or any tool-crafting digits. Okay, maybe otters? All evolved (de-evolved?) from ancestral land animals. Until Homo Savagerous showed up? They had reasonably cushy lives aside from naturally evolved predators. The only other noticeably brainy creature is the octopus. Tentacles are a poor substitute for hands. But their greatest handicap is short lifespan. The female octopus generally lives only a year or so. Just long enough to reproduce. The males can live a few years longer but by the last year or two show definite signs of dementia. Form does not just follows function. Form is selected by function. Cephalopoda have existed several hundred million years without developing tool use. Between then and today's ocean mammals have been endless varieties of ocean-going amphibians, reptiles, dinosaurs, and avians. It is my still unproven conjecture that the ice-capped moons such as Enceladus have sterile oceans. Until we come along and contaminate them with our bungling enthusiasm. I will concede a faint hope for life on Titan. However, I would expect we would detect traces of by-products by now. And even if native life is discovered any where in our Solar System? At best I expect it to be simple, Archean-type slimes and molds. Frankly and ernestly I hold out little hope of detecting interstellar Living Ocean Worlds. If in four hundred million years, all the different varieties of intelligent marine life failed to advance past "The Whale Dream"? I doubt if we will, in our existence, ever find it across the stars. Then your "water worlds" must not have tectonic plates, volcanic actions, subduction of plates, or any other movement on, within, or below the top of its mantle. There is also extreme pressures at the bottom of the Marianas Trench, but there is also the possibility of some form of movement of the upper mantle in spite of compression, due to shifting of the Earth's crust. If there is no movement of the crust and upper mantle even on a water world, then the enormous pressure may crack the surface at the bottom that would allow some of the contents of the hot molten core to flow out. SEU, why do you not at at least get a modicum of knowledge about the subject under discussion before you comment? Before commenting on water worlds or genetics or evolution or whatever, at least google it and see what it is about, before you give free range to your overwhelming urge to write something. This is a clear trend in your comment history. Why do you feel you have to comment on something you know nothing about? Fish cannot live of water alone they need food, usually other fish where these other fish need land for their food and protection from predatory fish. gran says: "no land means no fish", wrong, there would be rock formations and mountain ranges submerged. And not all fish need land. That is land, that cheating! This is simply not true for all whales and only partly because many aren't usually bothered that much from predators but also because sometimes deep ocean is the best place to avoid predators anyway. For example, there is the blue whale that in some places breeds in deep oceans. If you look at the above map, it clearly shows at least two breeding grounds (in red) that are in deep ocean. And in some cases their feeding grounds (in green) is also in deep ocean. Thus all the oceans could be deep and they wouldn't go extinct, no problem. How they could evolve without land is another matter. Yes, but only because whales evolved from land animals, NOT because they all must breed in shallow water. Look up the word "land" then come back to us. "the part of the earth's surface that is not covered by water"
P.S. There were fish in the sea before there was vegetation on that barren land 400 million years ago. So now you are arguing that sea animals cannot evolve to lay eggs in the oceans; Wow you are stupid! All one has to to is point to just one of the many examples of a sea animal that lay eggs in the oceans. It then it collects them and carries them around for months, it's not laying eggs and leaving them as salmon do. This is the precursor to evolving an egg that develops and is born as in mammals. sea horse's hatch eggs in pouches but then sea horse like coral reefs this why turtle bury their eggs as even Gonatus onyx lives all it life in shallow water so it needs land, there's no escaping the beaches, coral, rocky out crops, volcanic islands which are the reason there is so much diversity in the sea.